How dare you.....just seen a picture of the green truckers guide....do my eyes decieve me, is that a ribena drink with your food, and not a cup of tea? I've never ACTUALLY been there, but it is legendary . . Its been a while since I had a fry . . Damn diabetes !! . . .
Not a trucker just a joe bloggs. We travel down from Northwich, Cheshire several times a year just to have the "big Breakfast"
It's as good now as when we found it all those years ago. 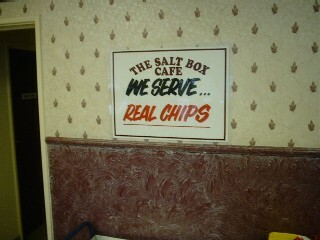 great site - something which I'm pretty sure is true is that one of the blokes out of Showaddywaddy owned the Saltbox. Maybe someone can confirm (or deny that). I don't think it was Romeo Challenger - the drummer, but one of the others. I think the Showaddywaddy connection was with the Silver Wheel cafe which was further down the old A50 towards Derby, in Etwall. We're off to the Salt Box for breakfast tomorrow.